THEY HAD ME at "we’re asking for less parking." On March 22 I attended the presentation in the Metropolitan Planning Commission’s (MPC) Arthur A. Mendonsa Hearing Room by Trent Germano, principal of Mariner Group, and Reid Freeman, president of Regent Partners. 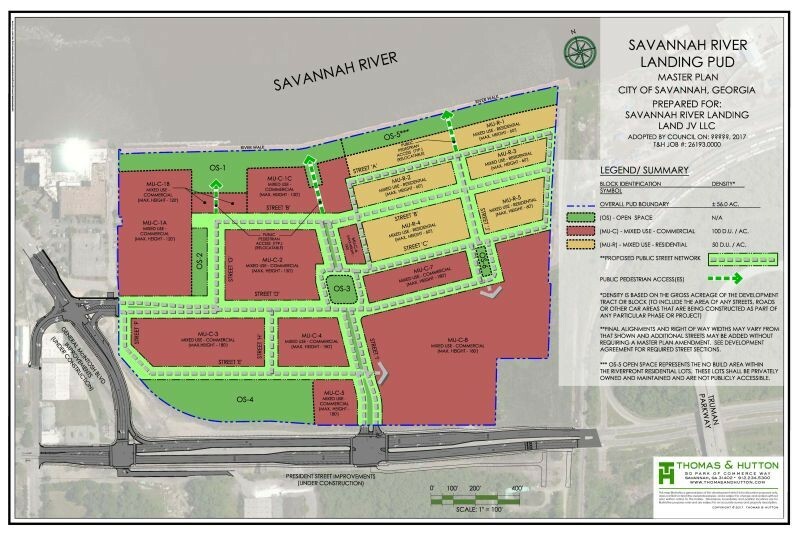 Together as the clunkily-named “Savannah River Landing Land JV LLC” they plan to finally complete what was started a decade ago east of the Marriott on East President Street. They struck me as sincere in their effort to build something that contributes to the urban fabric of Savannah, while also being refreshingly unapologetic in their desire to make money in the process. (One attendee asked if they considered including “affordable housing” in the mix. They gave a short, frank answer: No). Their desire for less required parking indicates an understanding of urbanism (complementary uses and compact design = less need to accommodate cars) and an eye towards maximizing the built area of the development. In addition, the structured parking will be wrapped with commercial, office, and/or hotel space. 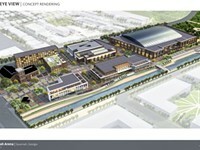 The garages will be mostly hidden, and sequester the bulk of incoming cars at the periphery. That means the interior streets are likely to be a wonderful pedestrian environment. 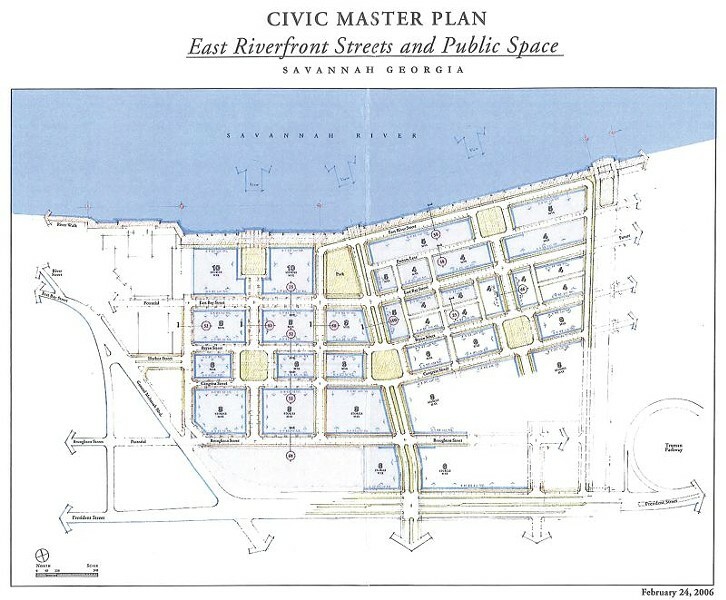 You can see all of this and more in the illustrated master plan for the new Savannah River Landing (SRL) development here, find more information online, and see the developers themselves present their case to the City at a future council meeting. 1. It’s not a faithful enough re-creation of the Savannah ward plan, and squares were removed from the previous iteration. I love the Savannah ward system. In grad school it came up on an almost daily basis, and I incessantly reminded my fellows that I actually owned a home in downtown Savannah (though not in the Historic District). They loved me for it. I’ve actually drawn out a Savannah ward diagram that I plan to have tattooed on my body at some point. However, I do not think that the Savannah ward is the answer to all urban design questions, and particularly not this one. I’ll tell you why. 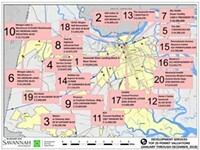 Savannah’s ward system is a framework that organizes a multiplicity of owners, architects, and users in a beautiful, harmonious, whole — a true gestalt achieved at urban scale. When the seas rise to the point that coastal populations are displaced and new inland towns and cities must be built from whole cloth, planners need look no further than Savannah for a model. However, this is because it is a proven system for organizing what I’ll call “Democratic Development” — city growth accommodating thousands of individual participants. Savannah River Landing is a very different thing. It is “Hegemonic Development” — one entity, 57 acres. Yes, residential parcels and condos will be sold off, but only according to the Master Plan, and only after being constructed by the chosen home-builder. The brilliance of the Savannah Plan is largely moot in this situation. The fact that the SRL Master Plan is including public space in the form of squares is a cosmetic concession, though a very welcome one. So, there is no reason to be wed to the dimensions of the original. This is the big-budget remake. They’ll take creative license. I don’t blame them. 1.b. A sub-argument: not all of the green space is public space. True. 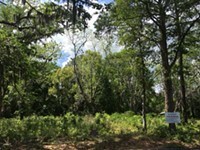 On the eastern, single-family residential side of the development, the green space facing the public riverwalk will be composed of private backyards that property owners will not be allowed to build on. So you can look, but you can’t walk. I am not put-out by this. In fact, I look forward to future voyeuristic pleasures. One of my favorite memories of London is walking along the Thames in the far west of the city. Similar to what is proposed at SRL, private yards abut the public walk along the river. On my walk I was mainly peering into yards, and not at the river. These owners knew their property was on display. It was an incredibly interesting psychological game to tease out what they wanted to say to passers-by through their yards. I can’t wait to spy on similar home-owners at SRL. 2. The scale of buildings is too large. 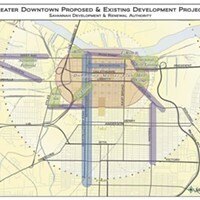 Yes, the developers are asking for maximum building heights that exceed the previous plan (the 2006 plan indicates maximum number of floors, whereas the 2017 PUD plan indicates maximum height in feet). 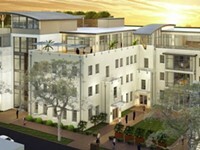 However, these buildings are not being inserted into the fabric of the Historic District itself. They are not even immediately adjacent. They will not loom over historic neighbors. Think of this area as a hybrid of Savannah and Midtown Atlanta, but without the traffic of the Peachtrees and Spring Street. We in Savannah like to insult Atlanta, but Midtown has wonderful walkable urbanism — I know because I lived there three years without a car. This is a marquee project for these developers. I have to believe that these structures will be well-designed and part of an attractive ensemble. Finally, consider this: The more intensely this land is allowed to be developed, the more tax revenue it will bring in, and the more it might relieve development pressure elsewhere. Maybe we can get the streetscape improvements to River, Bay, and Broughton Streets quicker for it. 3. It’s bait-and-switch – we’ll end up with a bunch of big box stores. The real estate market is a moving target. Smart developers want and need wiggle room. Some things will likely change as 57 acres are built-out over a number of years. The commercial parcel facing East President might be a grocery store. Yes, this could be pandering. It could end up being some other big box store. I wouldn’t consider that a betrayal. The parcels facing East President are destined to be auto-oriented with a lot of surface parking. Still, from the plan, it looks like developers intend to keep it compartmentalized from the walkable interior. Other changes might include the proportion of square footage allotted to commercial, office, hotel, and multi-family residential. This could change footprints and heights of buildings, but the important part to the visiting citizen, the network of blocks and streets, should stay the same. • One attendee was miffed that the rear of one of the parking decks might be visible from East President as he drove to the islands. This might spoil his drive, and his enjoyment of the Truman overpass, the water treatment plant, and Waffle House. 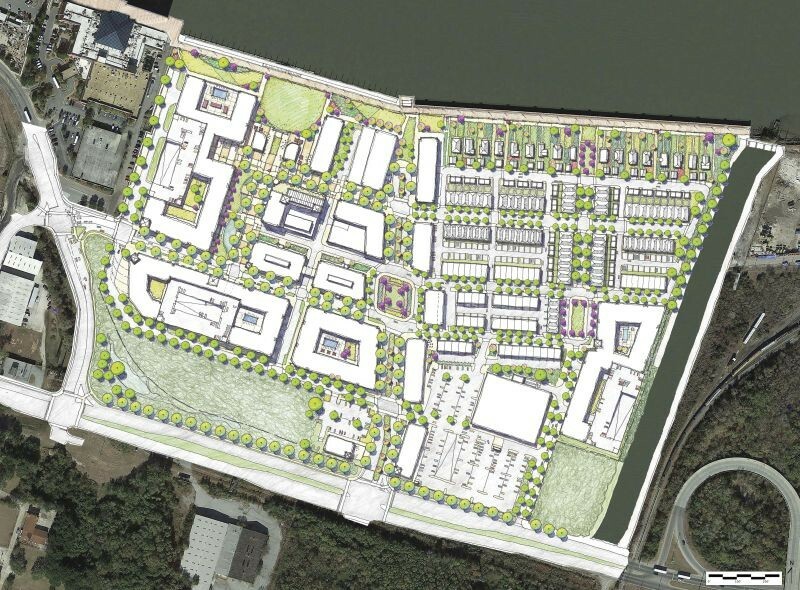 • Another attendee complained that the Savannah River would be viewed through a “tunnel” of buildings where the developers propose the linear park. I suggest to this attendee that he enjoy the view from the public riverwalk if buildings offend him. I’ll explain: The image above is a broad-stroke diagrammatic plan of development parcels, and of public and private division of the land within SRL. 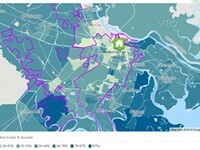 The colored areas do not represent building envelopes, but the entire developable area. The image below is an illustrated plan representing the buildings that the developers foresee constructing, gauging the market at this time. There’s no conflict between the two. In conclusion, I suggest that the new Savannah River Landing not be grudgingly tolerated, but greeted with wary optimism. 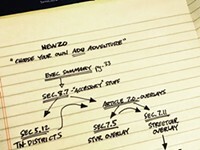 Will it have the same character as the wards of the Historic District? Of course not, but that’s not a bad thing. I’m looking forward to a more “big city” feel in this corner of downtown — something - Savannah lacks. If you live in Savannah because you hate the big city, well then you can just avoid this quarter. It will not detract from what we already have.